If I was writing this article just five years ago, when asked what an ebook is, I would probably have said a PDF. Where PDF is an acronym for Portable Document Format which, unlike say an Word document, is read-only and retains all the source formatting and layout. Nowadays, with the increasing ubiquity of ereaders, it might be tempting to define an ebook as something you downloaded to be read on an Amazon Kindle or Apple iPad. To make matters slightly more confusing, the humble PDF can be read on both devices. Where a PDF essentially differs from a book formatted for an ereader is that the latter, be it in ePub, HTML5 or the techie format, tends to be copy protected and tied to the purchaser’s account – not even their device. This means they can read it on their Kindle, iPhone and computer if they own all three. Neither of these descriptions however fully defines what an ebook is or can be. Before I explain, although I am a technophile and even writing this article on an iPad, as a reader, I am a big fan of the printed book. Specifically, I much prefer reading fiction in print but now favour the ‘ebook’ for non-fiction. As an author though, I am both agnostic and catholic about how readers of my books engage with them. An ebook in my eyes (and ears) is simply any of my content which isn’t print and that is delivered by electronic means. I want the reader to choose how they engage with my work. The publishing industry is going through the same transition as did the music industry 10 or so years ago. In some ways and in some areas, it is even overlapping and merging with it. One of the reasons being that the ebook is just about to come of age. Now an obvious format for an ebook is audio. This allows those with visual impairments to enjoy a ‘good book’. Many people like commuters and those with dyslexic different-abilities might prefer auditory input. 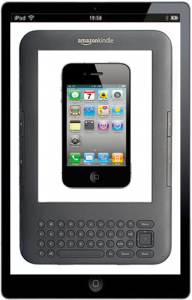 The exciting developments in the ebook arena are the Enhanced Edition book and the mobile app. In addition to the rich functionality offered by these two developments, the ebook and app also come with the potential of royalties of up to 70% for the enterprising author. All of this is of course in a context where the number of target devices is in the millions and growing daily. If I now have your attention, let me explain what they both are. Enhanced Edition books allow you to embed multimedia elements like audio and video inside a book. Good use of this format are books like Knitting for Dummies and Yoga in Bed. For ‘ebooks’ which are apps, even richer functionality is possible. For example, user input such as completing exercises or a journal or even engaging in dialogue with the author. Content can also vary depending on date, location or user type. The latter could be dependent on parameters such as age or subscription level. With all this choice, it would be easy to get carried away. Baby steps are advisable and market testing is essential. The future is very bright for both authors and publishers who embrace the possibilities that are opening up. The caveat being that the reader, listener and viewer is the ultimate judge of what is good use of the technology.